​​The district was situated between 77° 40' and 78° 37'E , of the eastern longitudes and 18° 05' and 19° N, of northern latitudes. The geographical area of this district is only 7956 sq. km constituting 14.02 percent of the state. It is also known as Indur. 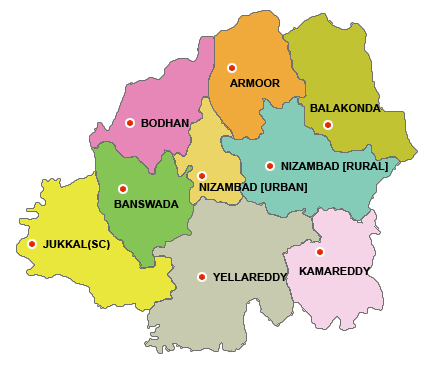 Nizamabad is the current and official name of the district. Nizam + Abad = Nizamabad, Abad means mass of people (Town). The district is bounded on the North by Adilabad district, East by Karimnagar district. South by Medak district, West by Nanded district of Maharashtra & Bidar district of Karnataka. The district has population of 25, 51,335 as per the 2011 census which accounts for 7.25% of the total population of the State with 8.77 decadal growth. Nizam Sagar Dam is an Indian dam. It is a reservoir constructed across the Manjira River, a tributary of the Godavari River, between Champed (Nizamabad) and Banjapalle villages of the Nizamabad district in Telangana, India. It is located at about 144 km north-west of Hyderabad. The masonry dam sprawling across the river for 3 km with a fourteen feet wide motorable road over it. There are excellent boarding and lodging facilities nearby, for tourists. Before Nizam Sagar was built, the Manjira River was not properly harnessed and little water was being used by diverting water at Ghanpur Anicut for Irrigating about 5,000 acres and an open Channel called Mahaboob Nagar (Right Canal) in Medak District. The Ghanpur Anicut was the first scheme constructed across Manjira river in 1904 at a cost of Rs.18.00 Lakhs. Some years later, Nawab Ali Nawaj Jung Bahadur as Superintending Engineer added Fatch Nahar (Left canal) to increase the utility of the river later. The ayacut of 17,308 acres was being irrigated under this Ghanpur Anicut which subsequently increased to 30,000 acres as per actuals. 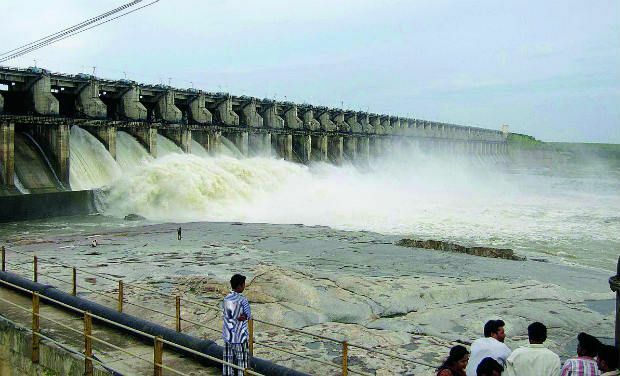 Nizam sagar Project is the second irrigation scheme on Manjira river and the largest in the then Hyderabad state taken up during the year 1923 and completed by the year 1931. This Project was originally contemplated for utilization of 58.00 TMC of water to irrigate 2,75,000 acres in Banswada, Bodhan, Nizamabad and Armoor Taluks of Nizamabad District. Dichpally Ramalayam or Khilla Ramalayam is one of the oldest temples in Nizamabad, Telangana. According to historical sources, it was built in the 14th century by the Kakatiya kings. It is also called Indhoor Khajuraho or Nizamabad Khajuraho. This temple has 105 steps and a pedestrian subway connecting it to Raghunadha Temple in the Nizamabad urban center. The temple is visited by thousands of devotees on Sri Rama Navami day (the ninth day of the month of Chaitra). It is located 10 KM away from Nizamabad district, Telangana.